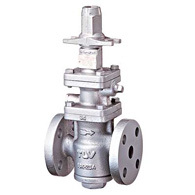 Compact pressure reducing valve for low flow steam. Pressure reducing valves with motorized actuator for remote operation. Multi-purpose pressure reducing valves for vacuum steam. Self-aligning, shock-absorbing spherical piston and advanced pilot regulator designs maintain secondary pressure accuracy. Internal secondary pressure-sensing channel (optional in some countries) makes external sensing line unnecessary. Because of its stable and accurate pressure at the secondary side, it is suitable for general applications on steam or air.